Delivers up to 15 batches/min at high speed. Vision system inspects each individual and removes damaged individuals and unwanted species. Product flow from grading machine is controlled by vision unit, which automatically regulates to optimize system efficiency. The system can grade by type, quality, color, size, thickness and length. The QC-Vision Batcher from Skaginn 3X is a new, high speed weight batcher with automatic quality control system and flow control. The system combines weighing with a revolutionary computerized vision technology for quality control. The weighing unit is designed to communicate with a unique packing system but can also be used as a standalone unit for all types of batching and packing possibilities. 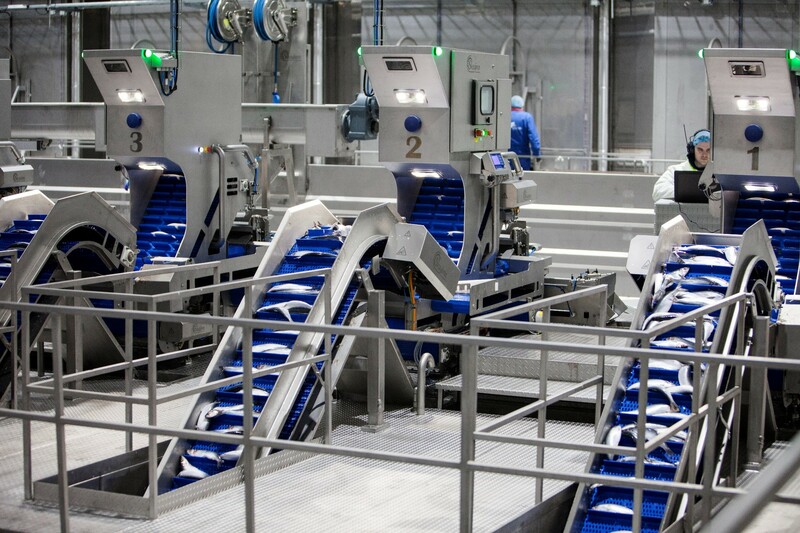 The system's vision technology scans and identifies each individual in terms of size, weight and species—information which is then used by the speed-controlled infeed conveyor belts to provide accurate and fast weighing. Automatic removal of unsuitable or damaged individuals increases the quality, accuracy and traceability of each batch. The adaptability of the weighing unit allows two different size grades of fish to be handled simultaneously. This is done by assigning a specific tag per batch for full traceability. Compared to traditional weighing/inspection systems, this breakthrough technology has high capacity, requires less floor space and is less demanding on manpower. The newest feature of the system is the addition of vision units that control product flow from the grading machine and distribute product traffic between different QC-Vision Batching stations. Once the product is weighed, it is automatically dispatched into a packing machine that forms the plastic bag and seals it before placing in a plastic tray on its way to the freezer. The bagging system has its own unique feature by allowing both brine/seawater injection into the bags as well as offering semi-vacuum packaging for faster freezing and increased shelf life of product. The bagging machine accepts sheeting made of non-transparent plastic, which provides UV-protection against sunlight.